Are your Blogging in Freedom? I was in Kinokuniya during lunch time to try to search for a cookbook for my aussie friend. Was walking towards the door when this book caught my eye. This is a book about freedom. Specifically the personal freedom I discovered from the wonderful world of blogging, the freedom I hope everybody will eventually discover for themselves. The freedom that, I believe, will permanently and irrevocably change the world for the better. This was the freedom I spent most of my adult life searching for, the same freedom I believe we’re ALL searching for, in one way or another. Careerwise, blogging gave me everything. Even in the early days, the ben­efits of blogging were so glaringly obvious to me, I couldn’t understand why more people weren’t doing it. Ten years later, I still can’t. So I decided to write a book about it; maybe I can help other people find this freedom, too. Many a times we hear people saying they do not know what to write in their blog, they are not writers (pls, who are born writers anyway? ), do not know how to find their own writing style or voice thus they do not want (or do not dare to) start blogging. Or they are afraid that their blog post may offend family/people/society/country (maybe the world?? ), therefore they always have some reservations when voicing their views. Well there you have it! The author, Hugh Macleod has the answer! All points are Starting Points. Have a thought, spur or moment thinking, an idea, a rant or whatever, blog it down! I always tell my friends, your blog belongs to you. You say whatever you want in it. Of course you must have some blog etiquette & alot of common sense (logical right?). If you feel strongly about a certain issue against your family member/the society/the nation/the world, write discretely. Use the appropriate words, do not just pin point a person or an issue and hammer mindlessly on that, you'll die an ugly death and I guarantee you that you probably don't know what hit you. You can blog just about anything, like me, I started to blog on the growing up of Little DinoEgg then it branches out to include the Family. Take some time to think about it, find out what are your passion, how you want the world to see your blog. Find your niche in the blogging world. You'll be surprise how you are able to discover yourself along the way. 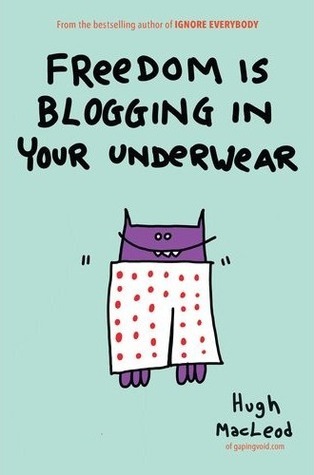 And eventually you'll be blogging away and finding that Freedom is really Blogging in Your Underpants.... ok ok, maybe minus the underpants part. Are you talking about me?!! Hmmmpfff!! But seriously though - I totally agree. Your blog, your voice. Why even write to please an audience? In fact, those who appreciate the way YOU think will definitely follow the blog. 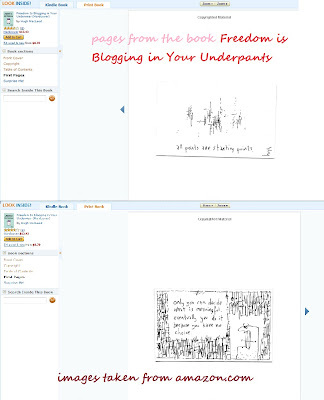 In any case, I blog to document stuff, (and to fuel my exhibitionist streak). There are many ways of describing an event or an opinion, it's always up to the individual's comfort level. That is the purpose of a blog right? To write what YOU think and not write base on what YOU think OTHERS will agree. PS : Pls pay bus ride fare hor. Cheapo. Same like Kino card! i cheapo auntie ma can? And yes, I blog in my underwear. I wear them everyday wor! wait wait... talking abt u & Regina coz u blog freely or u dunno what to blog? Do I swing the underpants on or off? I thought you may know how since you suggested it. ok you CAN swing underpants while wearing your underwear. Logic? My feel is, so long as my concious is clear, I say what I feel w/o offending anyone (in my view) then I can be as free as possible.